We the People is a unique sculpture utilizing various types of metal by Richard Bennett and Brian R. Owens. 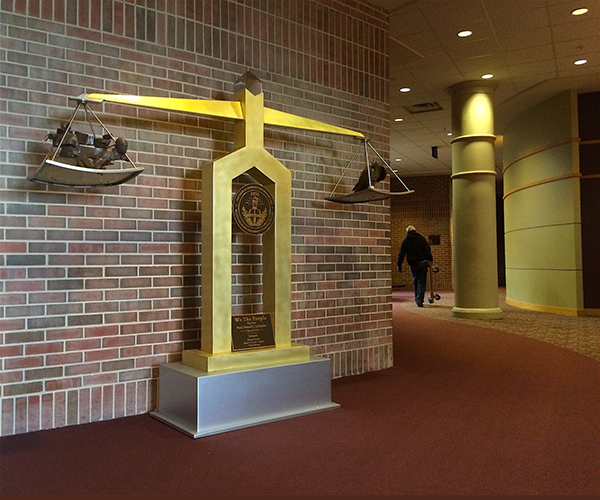 It was commissioned by Professor Emeritus of Law, Edward J. Littlejohn for Michigan State University College of Law and is installed in the Law College Building on the fourth floor, across from The Cliff & Carolyn Haley Moot Courtroom. 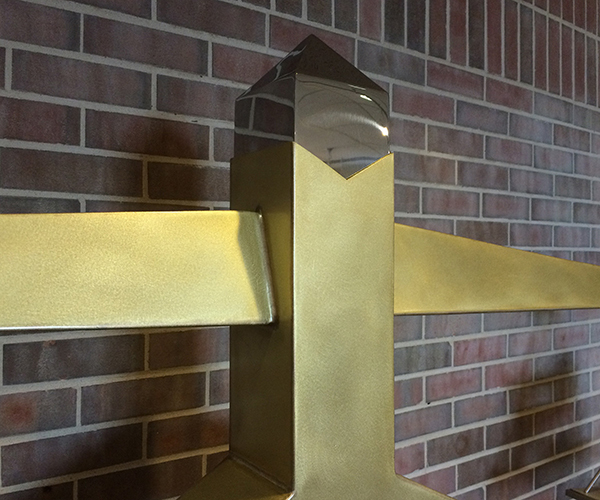 The sculpture was installed in late November, 2017 and formally unveiled on March 14, 2018. 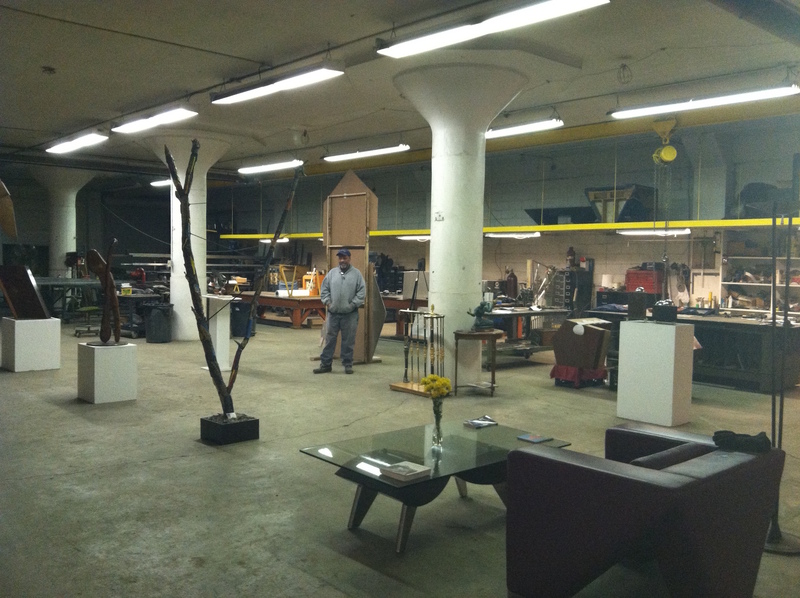 Detroit-based sculptor Richard Bennett takes a break in his studio in 2012. Brian R. Owens is based in central Florida and Richard Bennett's studio is in Detroit. "We've known each other for decades. Our styles are quite different but we think alike. Combining our strengths was not a problem." 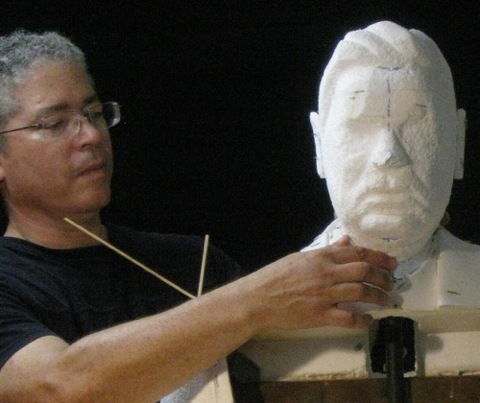 Sculptor Brian R. Owens in "the Belly of the Beast": His studio in central Florida. 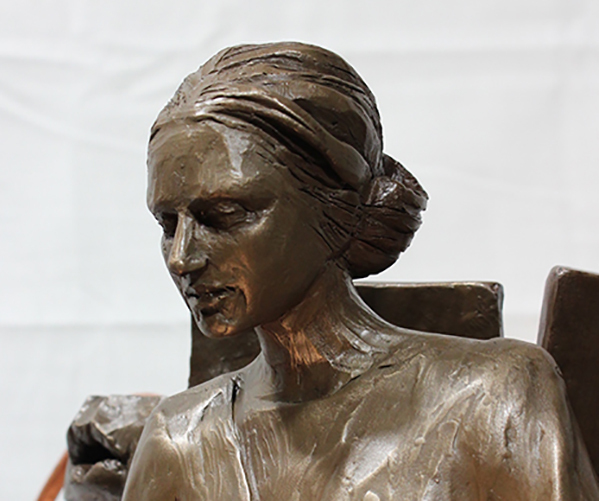 Bennett was an established sculptor well before Owens picked up his first block of clay. 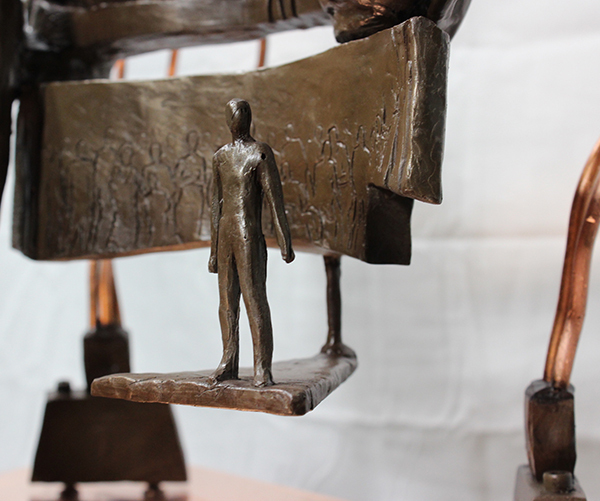 "The first sculpture I ever bought was by Richard in the early 1980's", said Owens. "I remember the shop he had in his garage ... metal everywhere ... welders hanging on tracks from the ceiling. Art was not new to me, and yet the place had it's own gravitational field. When Jacob Bronowski said "the hand is the cutting edge of the mind" he was talking about places like that shop. "Decades passed before I began to think like an artist. About the brevity of life. The necessity of passion. The importance of ideas. We first met to discuss this project in 2016 ... mostly about the ideas in play." "Richard came up with the general concept. 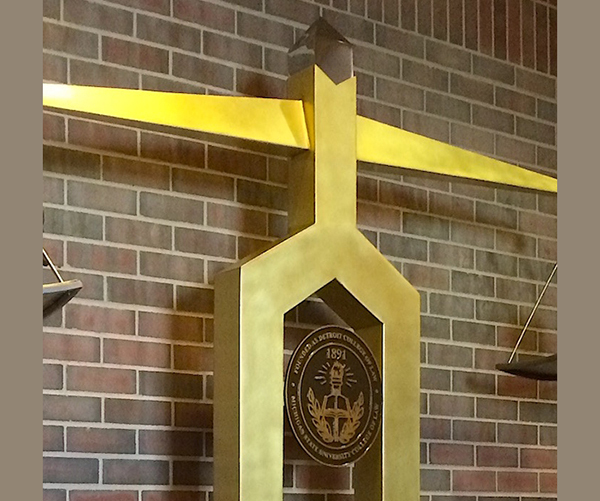 The scales of justice are usually depicted as empty and perfectly horizontal. We put ideas on them. 'The State' on one side and 'The People' on the other. It is inclined slightly in favor of The People. I sculpted these two elements and Richard built the rest. I worked on those figures until the minute I had to ship them." Owens continued saying "The People live in an entertainment-based culture, at the center of an arms race for their attention, fragmented, connected by unfolding technologies and yet grounded by a belief in their Constitution." Welding We the People in Detroit. 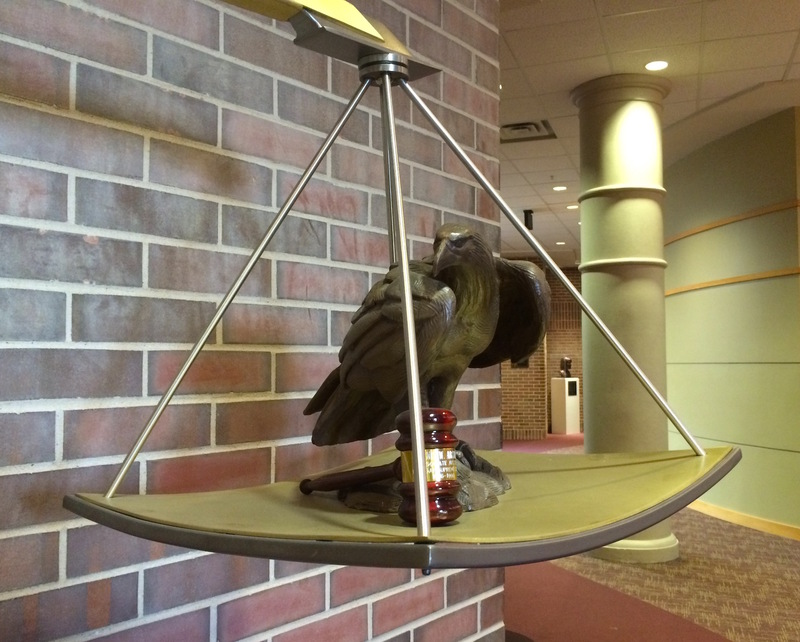 A gavel is placed near the side of The State, between it and The People. 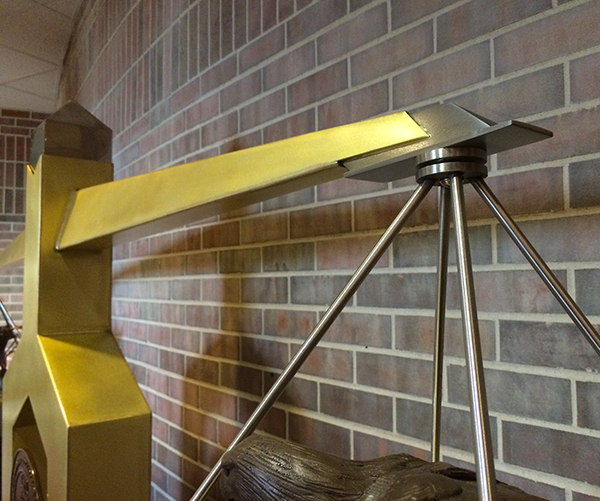 The sculpture was a gift from Professor Edward J. Littlejohn to MSU. 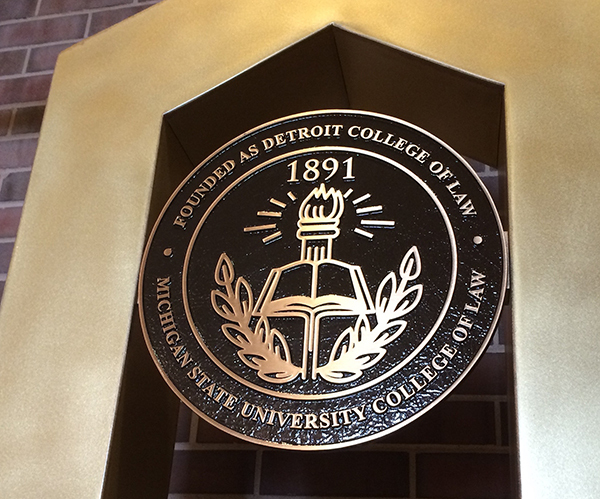 It is a tribute to his alma mater, Detroit College of Law (DCL). DCL was absorbed into MSU years ago. The Honorable Dennis W. Archer, from the class of 1970, is a former Michigan Supreme Court Justice. The gavel belonged to him. Gavel of the Honorable Dennis W. Archer, former Michigan Supreme Court Justice. 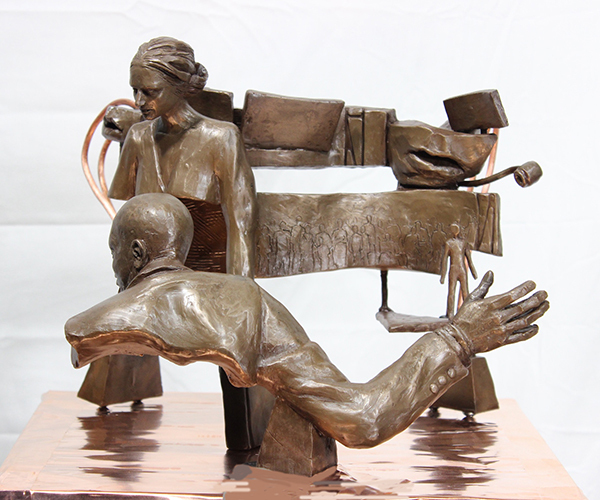 "We The People" was formally unveiled in March, 2018. 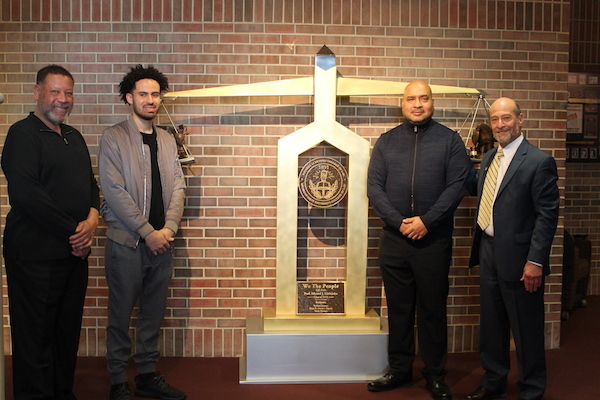 From left to right: Sculptor Richard Bennett, his assistant Travis Pittman, Martin Littlejohn (son of patron Edward J. Littlejohn) and Lawrence Ponoroff (Dean of MSU College of Law). 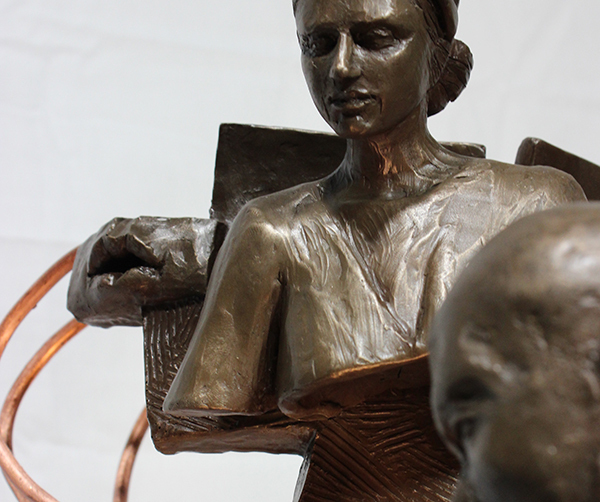 Sculptor Brian R. Owens was unable to attend. 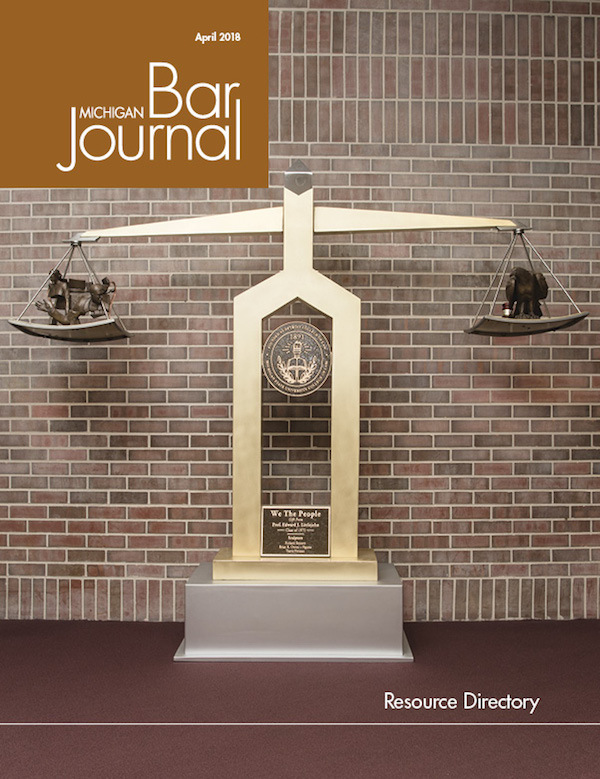 "We The People" was featured on the cover of Michigan Bar Journal (the journal of the Michigan Bar Association). Finding a place on the cover was no small feat. Many thanks to the editor and staff of the Michigan Bar Journal and our patron Edward J. Littlejohn, for making this happen. Brian R. Owens is a second-generation professional artist; a sculptor and painter, schooled in the methods and materials of classical, traditional fine art. 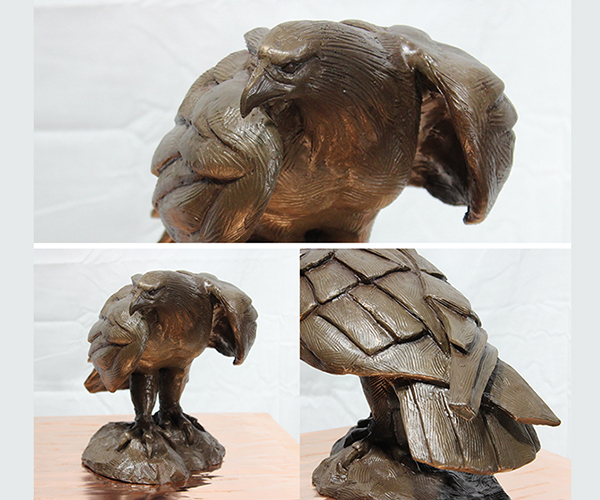 Owens' studio is based in central Florida about half an hour north of the Orlando metro area. For more information, call Owens directly at 386-956-1724 anytime after 10 AM Eastern time. Click on the link below to review his online biography and resume.